So I went out on Friday and without thinking too hard bought a blender, the book, a pint of vanilla ice cream, and a pineapple. The plan: Pineapples Foster Milkshake STAT. 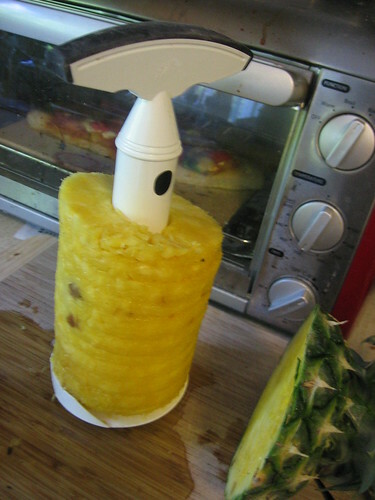 If you’re ever going to spend any significant time with pineapples you really need one of these tools: VacuVin Corer Slicer. I make pineapple salsa sometimes, and drinks. 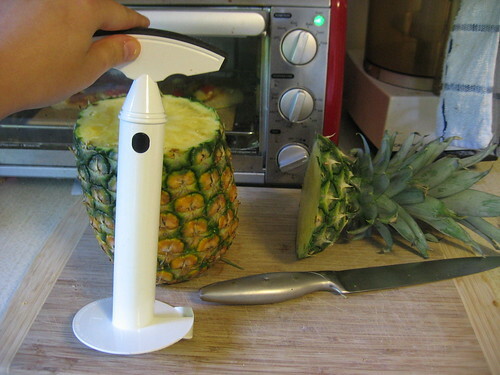 It comes with 3 sizes of blades and if you use a small pineapple you can even serve a drink out of it. You pretty much screw the tool right into the pineapple and pull! Voila out come your rings! I used to spend almost an hour dismembering a pineapple by hand. Now, 10min at most. 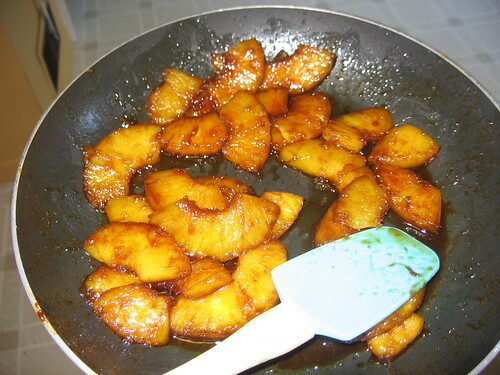 Following the book’s directions you fry the pineapple slices in butter and brown sugar. 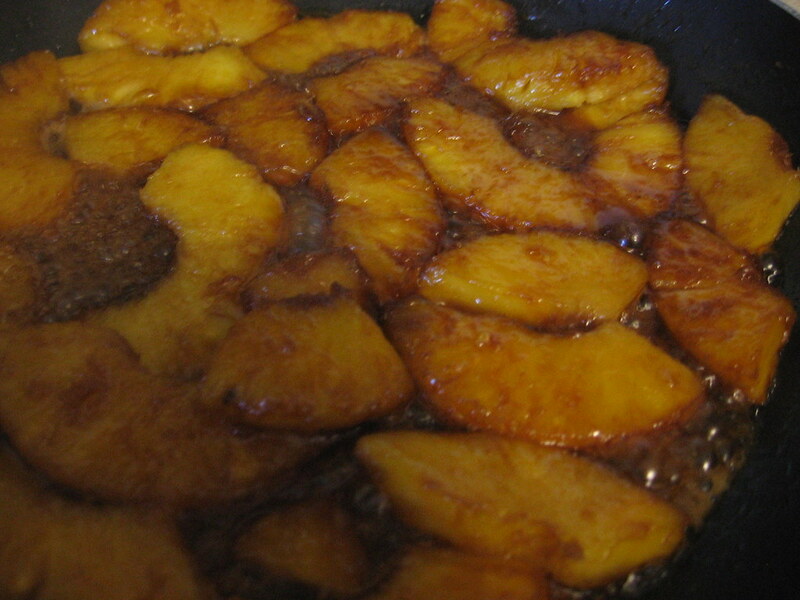 When they get very brown you add some rum and ignite it. It burned too fast for me to get a picture. But check out the yum. When it’s done burning you add cinnamon and allow it to cool. 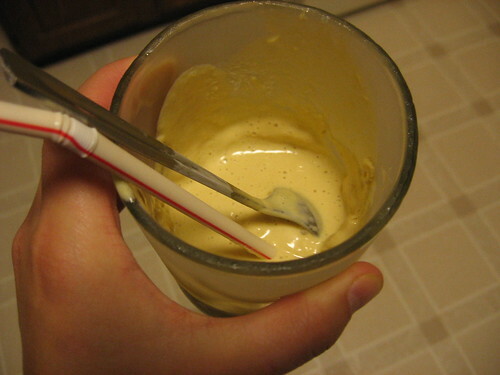 Then you puree everything in a blender as finely as possible. It’s a delicious sauce as is. Then you add the ice cream and milk and some more rum. Black Seal is dark rum that’s aged like whiskey in oak barrels. Absolutely the best. 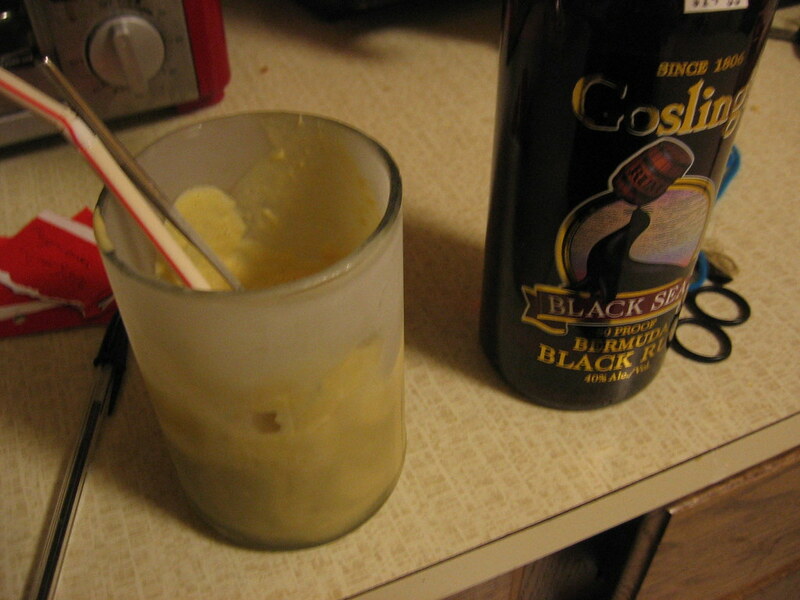 I drank some, froze more of it into popsicle molds, and froze the rest with extra rum in a cup. Let’s just say that I haven’t finished any of it yet. Apparently I need friends if I’m going to make milkshakes. >Today is a red-letter day because I discovered that one of the restaurants in Big Rapids was willing to make a NON-GARDENBURGER vegetarian sandwich for me. Courtney has this fantastic sandwich she orders in diners: a reuben with avocado subbed for the corned beef. They’re amazing and usually a great choice to order for some variety and I thank her heartily for introducing me to it. Only problem? Here in rural Michigan you can buy avocados at the grocery store, but none of the restaurants have them. Except today when I got sick and tired of not talking to anyone outside of work for the past 5days I took myself out to lunch alone at the local non-chain bar and grill. Was just going to get grilled cheese (sick of Gardenburgers) and then noticed that they had avocado add-in and a reuben on the menu. The waitress was super super nice and kept suggesting other things to add to it (presumably an all veggie sandwich couldn’t possibly be enough food). Apparently the kitchen staff thought this was an absolutely crazy request. Which brings me to my last thought here. I am sick to death of everyone thinking that vegetarians are crazy. I JUST DON’T EAT MEAT. That’s it. THAT’S ALL. You don’t have to cook anything weird for me, like the dreaded oh-so-scary tofu, or try and fail to make seitan. Just something without meat on it. Why is that so hard? Why is it crazy? On the other hand there are frakking Ranier cherries raining from the sky around here. Can’t go anywhere without another tempting roadside fruit stand. I’ll probably be a little sick tomorrow. Yes, I can eat a whole container by myself while driving home. 3x this week.